As media law becomes more complicated and some of the leading textbooks thicker and larger, this concise guide provides core information without patronizing those with existing knowledge or bamboozling those with little expertise. Suitable for journalists, media workers, and anyone in the cultural or publishing industries, the book engages and addresses the Internet and blogging, social networking, instant messaging, digital multi-media publication and consumption as well as traditional print and broadcast. 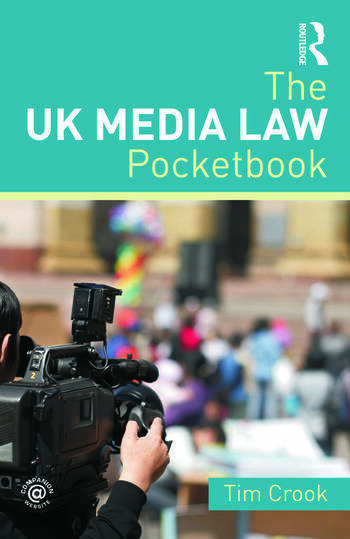 Each chapter covers substantive 'black letter law' and regulation/ethics, and kept in mind throughout will be the difference in duties and obligations between words and pictures, print and broadcasting. The focus is on the law relating to England & Wales, but with references to key differences to bear in mind in Scotland and Northern Ireland. Chapters start with bullet points, then flesh out the details and summarize pitfalls to avoid. Readers are left in no doubt about liabilities and potential penalties. Anticipating a dynamically changing arena, the text is also backed up by downloadable sound podcasts, videocasts, Internet source links throughout the book text, and a companion website so that any significant updates are immediately accessible direct from the ebook. Tim Crook, LLB is Senior Lecturer and Head of Radio at Goldsmiths, University of London. He has worked professionally in radio, theatre, television and film as a journalist, producer, director and sound designer for more than 30 years. Throughout this period he has taught media law and ethics to professional journalists and students at all levels. He is the author of The Sound Handboook (2011), Comparative Media Law and Ethics (2009), Radio Drama: Theory & Practice (1999), and International Radio Journalism: History, Theory & Practice (1997).